Erected in 1963, The Pavilion at 500 East 77th Street occupies the full block between 77th and 76th Streets and York Avenue and John Jay Park overlooking the East River. When it was built, this light-gray brick building had very few post-war neighboring towers. The building has a driveway and extensive sidewalk landscaping and a large lobby with a doorman and concierge. It has its own shopping arcade, landscaped roof decks, a 24-hour attended garage, a shuttle bus to transit and shopping, a windowed laundry facility, air-conditioning, ATM on site and a fitness center. 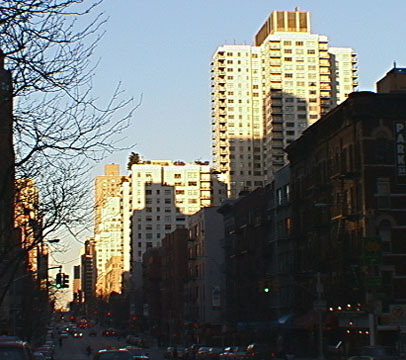 It is four blocks north of Sotheby's, the auction house, on York Avenue and there is cross-town bus service on 79th Street. There are numerous nearby restaurants. The huge building, which has a central tower, has 843 rental apartments and was designed by Philip Birnbaum & Associates. In an July 24, 2008 article in the New York News by Mallory Carra and Jason Sheftell, Stephen Maschi, vice president of marketing for Glenwood maintained that "There's an incredible brand loyalty here," adding that "I've been here long enough to have seen whole life cycles  renting to a single person, who'd get married and move into a bigger apartment. Then they'd have kids and move into a bigger apartment. We have a mix of apartments  studios, one-bedroom, two-bedroom, three-bedroom  so we're not just seen as a post-college dorm." The article noted that the Pavilion was Glenwood's first building and in 2008 two-bedroom apartments there start at $4,995, adding that the building contains an in-house grocery store, spa services and a salon: "In the early '90s, Glenwood began updating the Pavilion, adding granite kitchens and stainless steel appliances. Two years ago, it turned vacant apartments on the building's second floor into a playroom and a fitness room. Glenwood's frequent resident surveys inspired the enhancements. Done every three years and passed out to all Glenwood renters, the surveys give detailed insight into the exact demands of Glenwood renters. 'Styles change and things get worn,' said Maschi, who lives in the Pavilion. 'Granite countertops have become standard now and they're required if we want to compete with the condo market buyer.' The building also provides a shuttle bus to the nearest subway station. Service always gets rated as among the highest perks of living in a Glenwood building. 'If there's a scratch on the window, most landlords wouldn't consider that a big deal, but here they'll replace the window for you," said resident Philip Seldon, who has lived in the Pavilion for a year and a half and also works for Magazine Emporium in a corporate apartment in the building. 'The level of service here is almost like a hotel, except they don't come in and do your bed.'"